International Edition. By William Preucil, Jr., and piano accompaniment performed by Linda Perry. This edition: Performance/Accompaniment CD; International. Method/Instruction; SmartMusic; String - Violin (Suzuki); Suzuki. 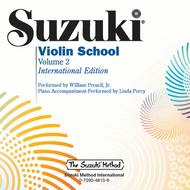 Suzuki Violin School. CD. Alfred Music #00-47076. Published by Alfred Music (AP.47076). This CD of the Suzuki violin method, Volume 1 features recordings by William Preucil Jr., and piano accompaniments by Linda Perry, as well as piano accompaniments recorded alone. Titles: Study Points for Volume 2 * Chorus from Judas Maccabaeus (Handel) * Musette, Gavotte II or the Musette from English Suite III in G Minor for Klavier, BWV 808 (Bach) * Hunters' Chorus from 3rd Act of the Opera Der Freischutz (Weber) * Long, Long Ago (Bayly) * Waltz, Op. 39, No. 15 for Piano (Brahms) * Bourree from Sonata in F Major for Oboe, HHA IV/18, No. 8 (Handel) * The Two Grenadiers, Die beiden Grenadier, Op. 49, No. 1 for Voice and Piano (Schumann) * Theme from Witches' Dance (Paganini) * Gavotte from Mignon (Thomas) * Gavotte (Lully) * Minuet in G, Wo0 10, No. 2 (Beethoven) * Minuet from Sei Quintetti per Archi No. 11, Op. 11, No. 5 in E Major (Boccherini).